In depth exploration of different antivirus options is beyond the scope this article. Explore “Azure-Web-Apps-Antivirus” source code and instructions on Github. This article will only cover the interesting parts of the solution, if you have questions please do comment. 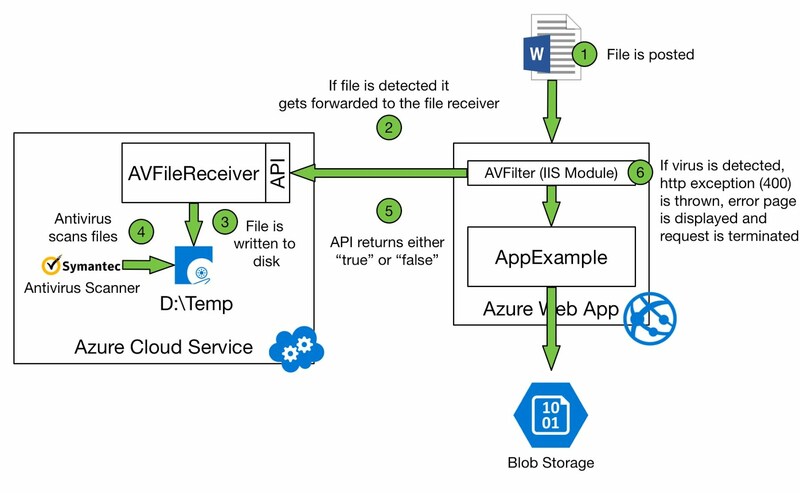 Filtering uploads and downloads is relatively straight forward thanks to IIS http modules, read more about them here. Take a look at the full implementation here. When it comes to intercepting downloads it’s not as simple. Unfortunately outgoing traffic is written to the System.Web.HttpResponseStreamFilterSink and this stream is write only, so you can’t read it. So the only option that I and Google can think of is to proxy the outgoing stream. To make this happen I have created proxy class that changes write only steam to write/read stream, I have conveniently called it ReadWriteProxyStream, take a look at the implementation here. For this proof of concept I have used Symantec virus scanner which comes with CLI, and to test it I have used EICAR test virus. EICAR test virus is harmless, it can’t actually do anything to your machine. © Zan Kavtaskin. Simple theme. Powered by Blogger.